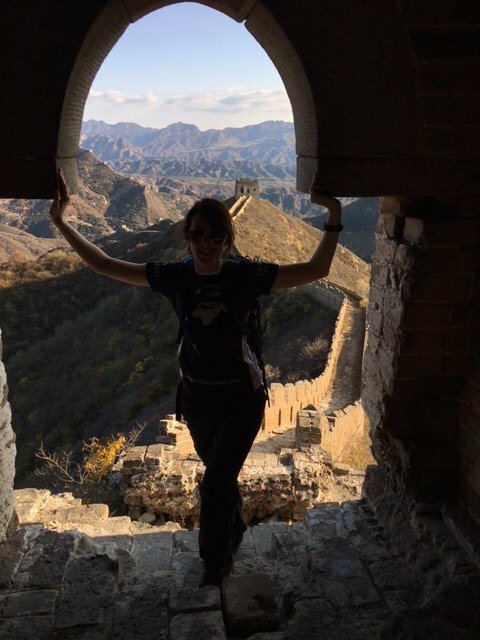 Well I’m back from China and what a fabulous experience it was. 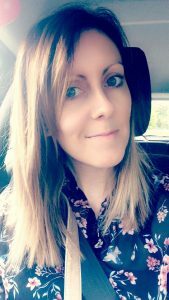 I wanted to write a blog post each day I was there but I didn’t have my laptop in China and so I thought I’d write a day by day update now I’m back. Overall, I had an amazing time and met some truly inspirational people, who all had personal challenges to overcome. Fitness wise, it was challenging but surprisingly I didn’t find it too bad. The bigger challenge for me was the rough terrain and the steepness, as slipping was a real concern. I think all the running I did beforehand really helped with the fitness side though. Before I went, I was worried about how my back would cope and I was right to worry. On day 3 I managed to injure my shoulder, which was very painful for the remainder of the trip. I think this was a result of carrying a heavy back pack while trekking. My shoulder is still very sore and it feels like I have torn the muscles there. Due to my scoliosis, I already had weakness there, as the muscles are weaker on one side. This is where I have also strained my muscles previously by running. So I think the combination of the heavy back pack and swinging of the walking poles must have been pulling on this and it kind of re-ignited the previous injury. In all honestly, I was a bit upset by this, as I wasn’t able to carry a backpack for days 4 and 5. This made me feel like a bit of a failure, like my back let me down and it also made me feel like I’m not invincible! 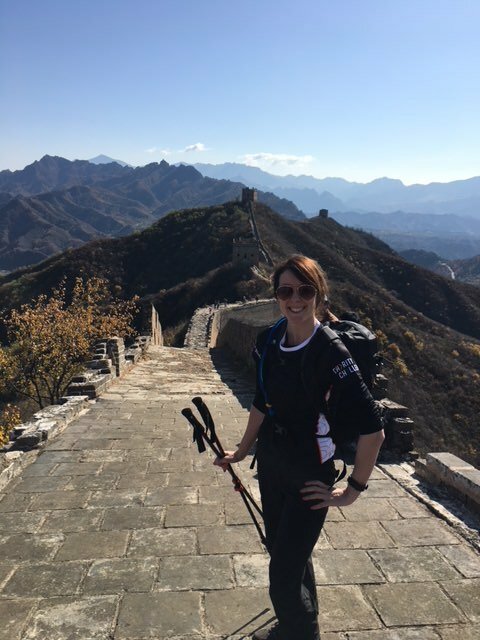 Luckily, everyone was so kind and carried my kit and water for me so I could continue on with the challenge (even though it was very painful). The best part was that I managed to raise OVER £1,000 for the Scoliosis Campaign Fund! I really can’t believe it and I’m so grateful to everyone who donated and made this possible. We had arrived in Beijing the previous afternoon, very tired and very jet lagged! After checking into the Impression Lodge and having a brief use of the WiFi, we headed to the restaurant for a yummy Chinese meal and a couple of beers. This was a chance to get to know the others in the group a bit more (some of us had already met in the airport/on the plane) – there were 17 of us all together. As we were all tired, after a couple of drinks and a briefing about plans for the next day, we headed back to our rooms and packed our day sacks ready for the first day of trekking. 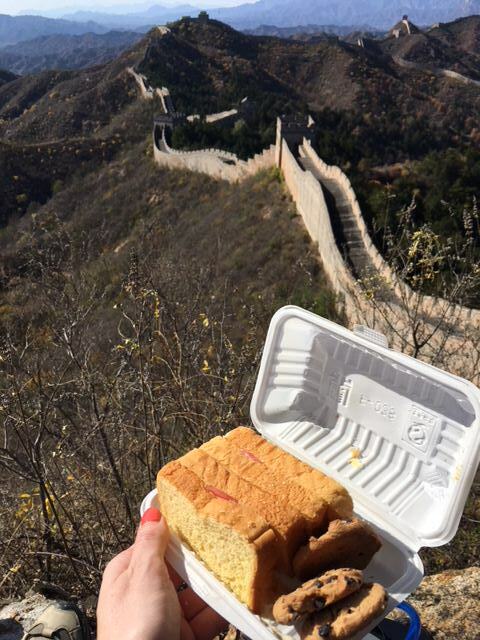 On day 1, we woke up early and headed to breakfast, after which we made our packed lunches, which consisted of strange yellow Chinese bread and some fruit and biscuits, and we filled our water bottles/bladders. 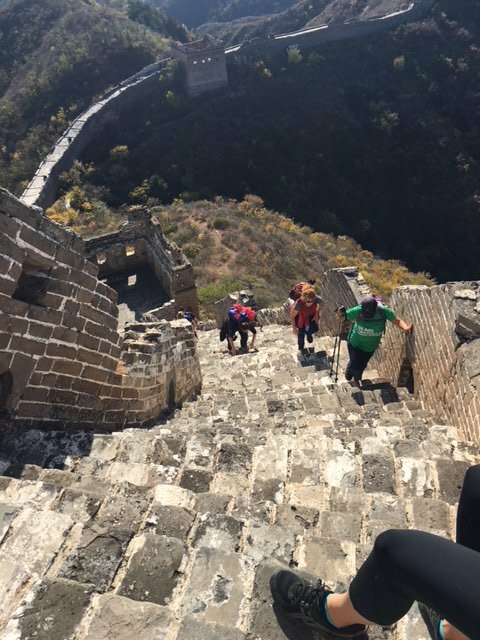 At this point it still felt surreal to us all that we were actually in China and about to do what we were going to do! We then got onto the coach, taking all our bags and stuff with us, as the next night we were staying at a different lodge. This part was a bit of a pain for me as lugging my huge rucksack around was really not easy! Most of the time I dragged it along the floor or some one helped me with it (luckily). 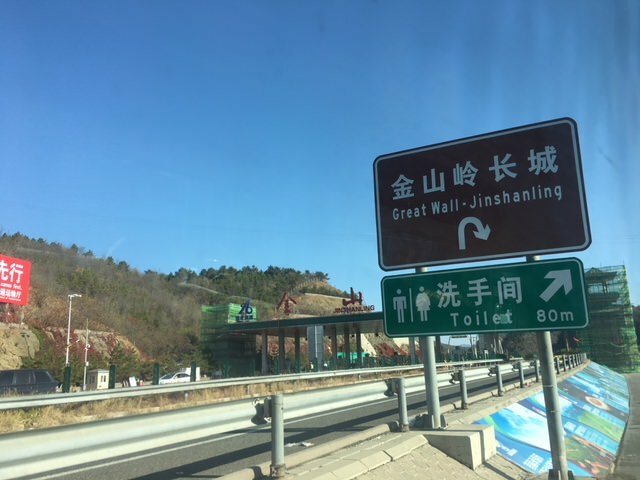 We travelled about an hour or so to our first challenge: the Jinshanling Loop. 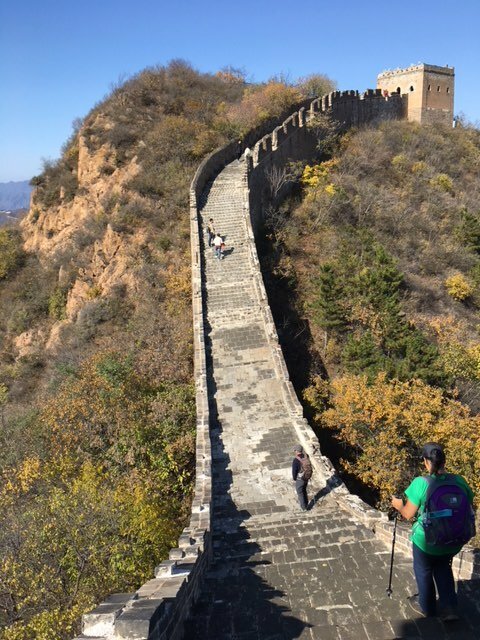 We felt very lucky on the first day as the weather was perfect for walking and for getting some truly stunning views of the wall – it was sunny with pure blue skies and a high of around 17/18 degrees. When we arrived, we had a quick toilet break and our first experience of the Chinese “squatting” toilets! Luckily they were clean but it was a strange experience initially, as we are not used to them back in the UK. We then walked up to the visitor gate and got ourselves ready, sorted out our walking poles etc and headed on for the first part of the trek. 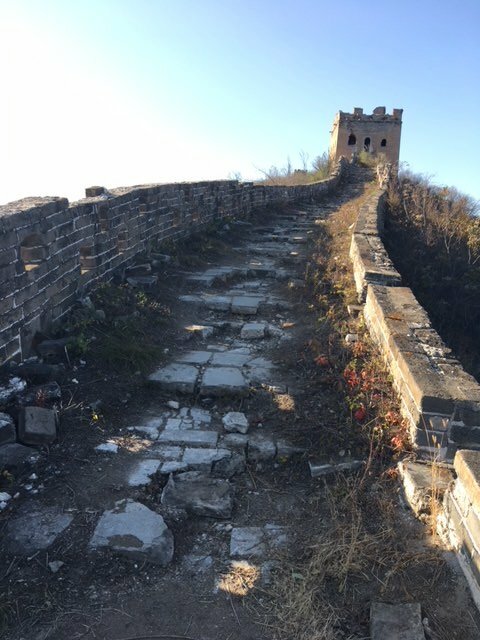 To get onto the wall itself, we first had to walk up ALOT of steps and I think this is the first point where I (and others) realised how tough this was going to be. 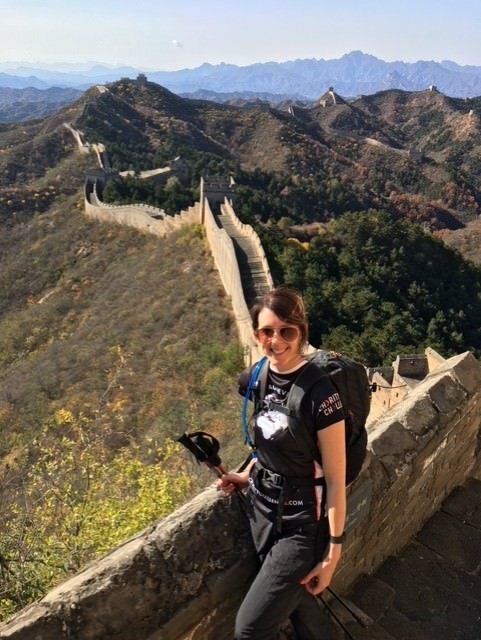 It took at least an hour of climbing what felt like endless steps before we made it onto the wall, but when we did, my god the views were worth it. 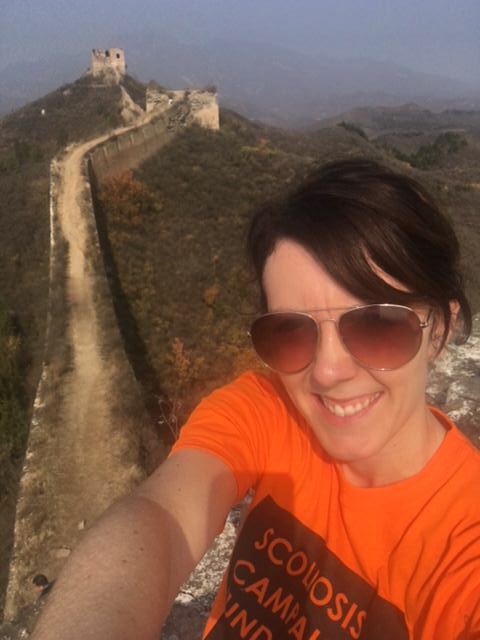 This was the first time we had properly seen the wall itself and I was taken aback by how beautiful it was, especially as it was such a clear day and you could see the wall snaking around the mountains for miles and miles. One of the main things that hit me at this point was also how steep the wall was! The word of the week was undulating – as it was pretty much constant ups and downs. I don’t think anything can prepare you for the sheer steepness, as we really have nothing like it back in the UK. The pictures don’t do it justice but I took some pictures just to try and show how steep it was. 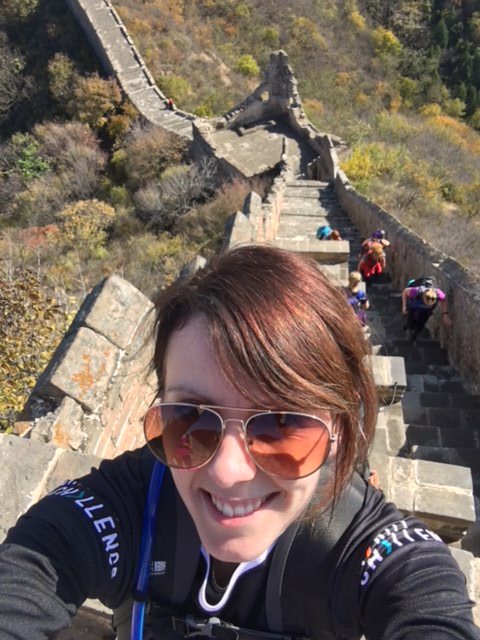 All I can say is I really don’t know how people manage to run the Great Wall of China marathon on here!!! 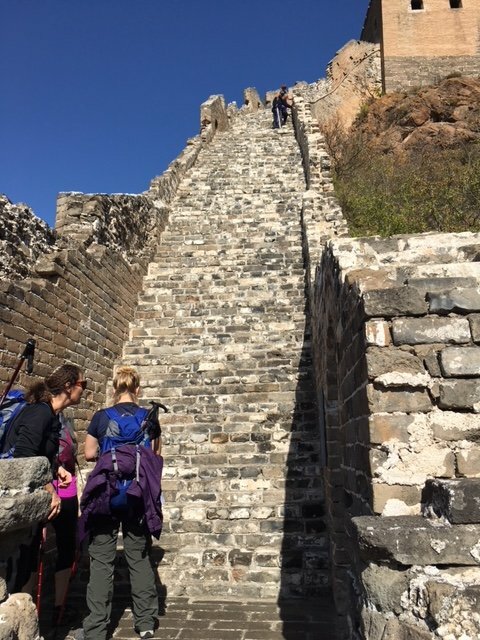 After lunch, it was more of the same and after more trekking and being chased by women selling t-shirts, magnets and purses, some of the group started the walk down back to the coach and the rest of us carried on a bit further to an older, less renovated section of the wall. This was the first time seeing a less renovated part and it was sad to see it literally crumbling away in sections. 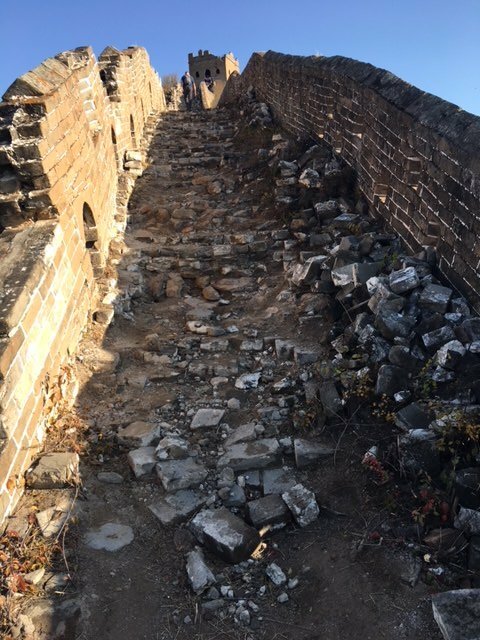 We walked as far as we could until we came to a section which had completely crumbled away, so was impassable. After this, it was time for the descent back down to the coach. The steps down felt like they went on forever!! When we got to the bottom, we were sweating and our legs were aching but we were pleased to see a guy selling beer in the car park – result! So of course I (and a few others) bought a beer and we sat in the sun and drank it before getting on the coach and heading onto the lodge where we spent the second night. 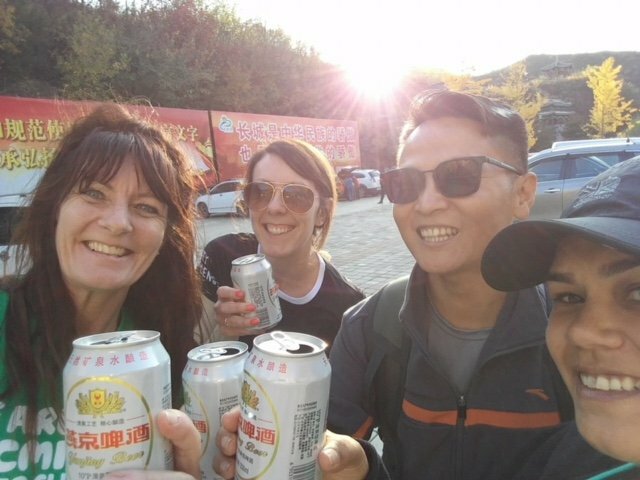 China Trek Day 1 – Beers! A great end to a fantastic first day! 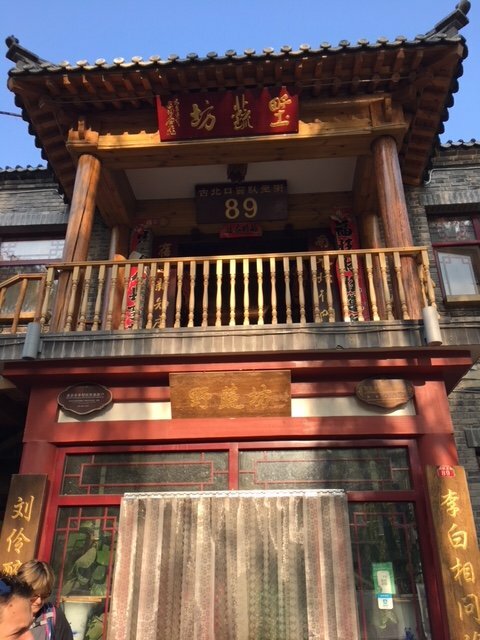 After finishing our beers we headed to the next stop – Green Lodge in Gubeikou village, as on day 2 we would be trekking the Gubeikou section of the wall. On the way though, just as we were starting to relax, our coach got stopped for a random police check and we had to haul all our luggage off the bus and take it, with our passports, to be checked in the police station! That was a little scary and also the first time it’s happened to our guide. Everything was ok though and we all got back onto the coach and arrived at the Green lodge an hour or so later. 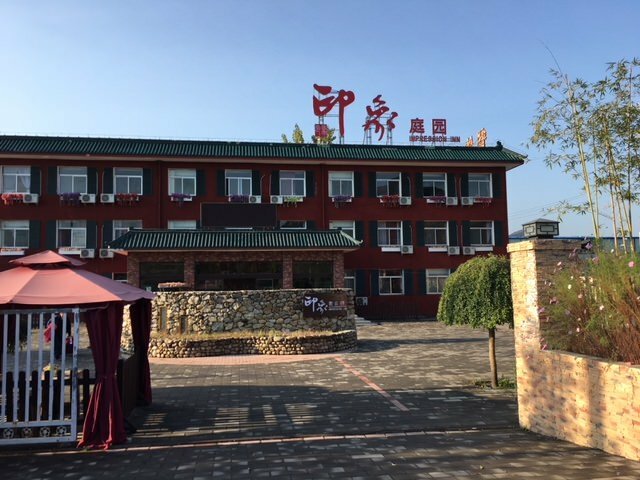 This first night was my favourite night of the whole trip as the lodge was really cute, very authentic Chinese. After a brief rest, shower and packing of our bags ready for day 2, we headed downstairs for food. 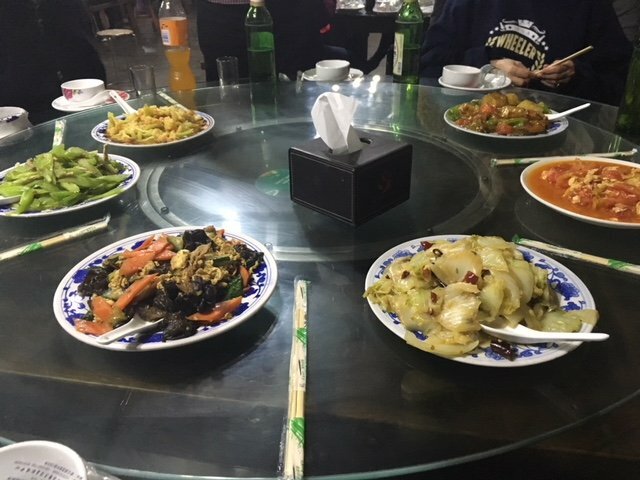 We had an amazing meal of traditional Chinese food and beers, and tried some traditional Chinese rice wine, which is very strong and tastes like more of a spirit than wine. 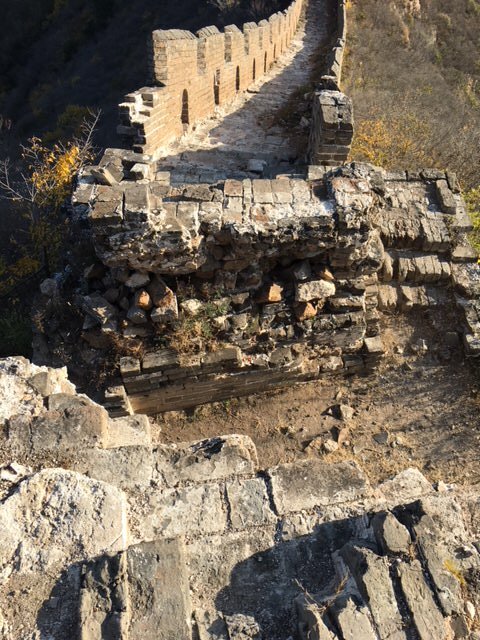 After a good night we headed to bed, exhausted and ready for day 2 – the Gubeikou section.